New Aerial Dance Part of W&L Repertory Dance Co. Program The program will include multifaceted dance works created by nationally renowned choreographers, as well as new aerial dance technology. The Washington and Lee University Department of Theater, Dance, and Film Studies will present the award-winning W&L Repertory Dance Company March 29-31 in a program of multifaceted dance works created by nationally renowned choreographers. This fully produced concert of six works contains the fruit of three artistic residencies that occurred throughout the semester. Nationally renowned choreographers Taylor Mitchell, Jessica Miller Tomlinson and Shaun Boyle D’Arcy each spent four days at Washington and Lee offering master classes and holding intensive choreographic rehearsals with W&L dance students. 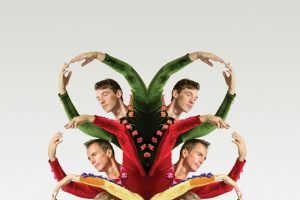 Mitchell is a Chicago-based dance performance artist and international educator who is recognized for his physical theater/clowning technique. He has created new works for DanceWorks Chicago, among others, and has served as an artist-in-residence with Southeast Missouri State University and Keshet Dance and Center for the Arts. His work “All I Need Is…” is a spoof on love and human relationships. Tomlinson’s work has been presented at the Jacob’s Pillow Dance Festival in Massachusetts, The Joyce SoHo in NYC, the Harris Theater for Music and Dance in Chicago and numerous international venues, including the Edinburgh Fringe Festival. Tomlinson is currently on faculty at Hubbard Street Dance Chicago, the Hubbard Street Youth Dance Program and Joffrey Academy of Dance in Chicago. Her work, “Homesick Blues,” is an abstract composition for 10 dancers. The dance has four distinct sections, each with a different feel, inspired by and set to the music of Bob Dylan. Boyle D’Arcy has danced with Cedar Lake Contemporary Ballet company and BalletMet, among other companies, and has performed in David Dorfman’s ”Underground” at the BAM Next Wave Festival, and in the London 2012 Olympic Torch Relay performances in England. Her dance, “Gambaru,” is based on a Japanese expression that refers to perseverance and enduring difficult times. It was commonly used during the 2011 earthquake and tsunami recovery and was an encouraging reminder for the community at large to persist in their rebuilding efforts. Davis Straske ’19 and Spencer Alascio ’19 rehearse an aerial dance routine featuring new rigging technology. Davis Straske ’19 collaborated with Spencer Alascio ’19 and Davies on an aerial bungee dance that incorporates new technology and brings aerial innovation to the Keller stage. W&L was one of the first universities to have an aerial dance program, and continues to push the boundaries of the genre. Straske’s idea for her piece was developed during an independent study project that sought to reframe a typical tango by approaching the duet with one dancer rigged to a single-point bungee performing with an untethered partner. This concept was made possible by the creation of new rigging technology that consists of a 20-foot truss that Davies, who is tethered to Straske, climbs in order to raise and lower her. Constructed by professional aerial riggers and overseen by theater department technical director Tom Hackman and professor Shawn Paul Evans, it’s a new step toward broadening and deepening the aerial program at W&L. The evening also includes a restaging of Davies’ 2006 work, “Blame Game.” This piece, danced by members of the W&L Repertory Dance Company, is a silly look at love and loss from vantage points of both strength and sorrow. The W&L Repertory Dance Company concert will be held in the Lenfest Center at Washington and Lee University March 29-30 at 7 p.m. and March 31 at 2 p.m. Tickets can be purchased at (540) 458-8000 or online here.